Mubarak Walks Free, In What Could Be The Final Twist For Egypt's Former Dictator : The Two-Way Hosni Mubarak, 88 and ailing, was acquitted by Egypt's top appeals court of charges that he ordered police to kill anti-government protesters in 2011. 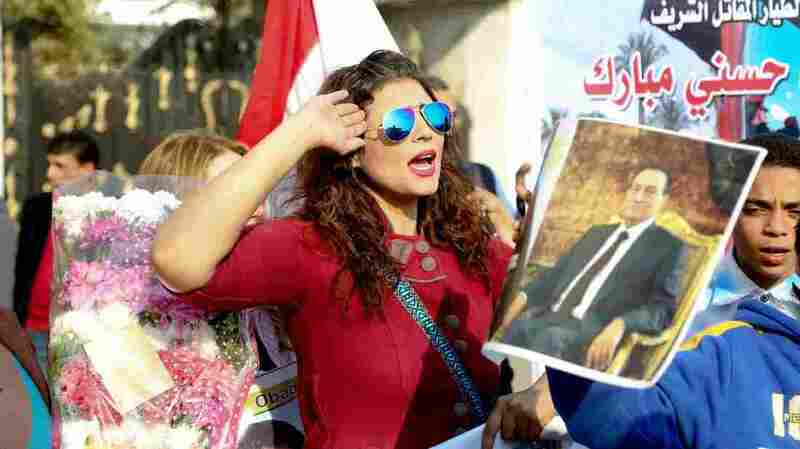 After a prosecutor issued an order for Hosni Mubarak's release earlier this month, a group of people gathered in front of the Al Maadi Hospital in Cairo to celebrate. Six years after the Arab Spring, Egypt's former leader Hosni Mubarak has left a military hospital and is heading home. Mubarak, 88 and ailing, was acquitted by Egypt's top appeals court of charges that he ordered police to kill anti-government protesters in 2011. Mubarak had ruled Egypt for 30 years; now he will live in his home in Cairo's wealthy Heliopolis district, according to local media reports. "The former president is not completely out of the clear," NPR's Jane Arraf reports from Cairo. "He faces potential charges on allegations he received gifts from a state-owned newspaper. But he's not expected to be taken back into custody unless he's convicted." The ousted dictator was acquitted on March 2, but it wasn't clear whether he was well enough to leave the Maadi Military Hospital where he received care while detained. In televised court appearances, Mubarak was wheeled into the courtroom on a stretcher. When prosecutors ordered Mubarak to be released on March 19, his supporters held a rally outside the hospital, drawing an appreciative wave from their former leader at the window of his room. As NPR's Merrit Kennedy has reported of the protester case, "This marks the end of a six-year court battle, during which the political landscape in Egypt has shifted dramatically. Many of the protesters who led the 2011 uprising sit in prison, while many figures associated with the Mubarak regime have re-entered political life."